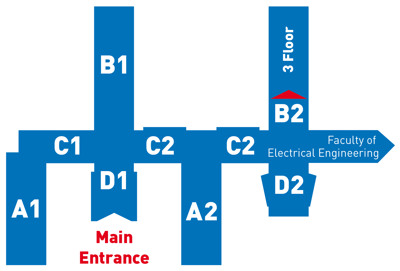 Department Of Designing And Machine Components is on the 3rd floor of the Faculty of Mechanical Engineering in Dejvice, Technická street 4, Praha 6.. Enter by the main entry, go through the vestibule, turn right and then take the stairs on the left next to the „pater-noster“ lift of the block B2, and go to the 3rd floor. There, between the lift and the stairs is the Department Of Designing And Machine Components..